I'm seriously considering moving to 3 wheels. I've ridden for years and presently ride a 1500 Goldwing. My wife likes the CanAm and the stability (she feels safer). I found one here in a town a guy is selling (2012 1 owner asking $11,500) because of back problems. I enjoyed the test ride although it will take a bit of getting used to. My wife also enjoyed the seat. Sooo...my questions are: Are they reliable bikes? Are repairs expensive? Anyone regret the move from 2 to 3 wheels? After about a year and ~4,000 miles, I am still not what you would call really "happy" with my Spyder. But I am determined to keep it and make the best of it. I am presently starting the follow the recommendations for alignment and a stiffer sway bar to help minimize the "pitch and roll" feeling of 3 wheels......but I just don't think that most of that is really "fixable". I am a conservative rider with an RT, who had been riding 2 wheels for about 50 years. Miles in the seat has gotten me over the "out of control" feeling I had at first......but it still dances and wanders around at speed. That probably is a good price but older models can have frequent mechanical problems.....as you can see by reading old threads on here. Some seem to have almost no trouble at all though. It's a gamble. They are NOT as reliable as most Honda's. That"s actually a little steep on the price, I bought a 2012RT for $9500.00 and that's pretty average. The book for more but they are not bringing the money. The model changed in 2013 and was much improved. That said, I love my 2012RT!!! !I've been riding 2 wheels for 40+ years and the transition took some getting use to. The repairs, accessories and maintenance are expensive but the bike is awesome. The sound and ride is quite an adjustment. My legs are starting to go bad and I can't hold up the big cruizers anymore. Check prices on line and see what they are running. Consider a 2013 or newer if you can afford it, but the 2012 is a great bike. Hope this helps! Thanks all for your insightful responses. I agree, the switch is going to have a learning curve, but I did go back and took it for another ride. This time we went down the road and it handled very well at highway speed, I think. He came down on the price and I'm picking it up today. It does have the backrest/trunk and side bags. That, combined with the front "trunk" (Surprise! I had no idea), I have more carrying capacity than on my Wing. Plus I love the one button adjustable windshield and semi auto shifting. Major factor....my bride already enjoys riding this more than the Wing...that sealed the deal. I figured that repairs would be more. Oh well, hopefully I got a good one. He had it serviced where he bought it new and had regular maintenance work done. He highly recommends their work. And I know I have been spoiled by the Honda quality. Another surprise....I texted a pic to my son and he told me that our DIL had just gotten a 2010 Spyder last week and they were coming over this weekend to surprise us. 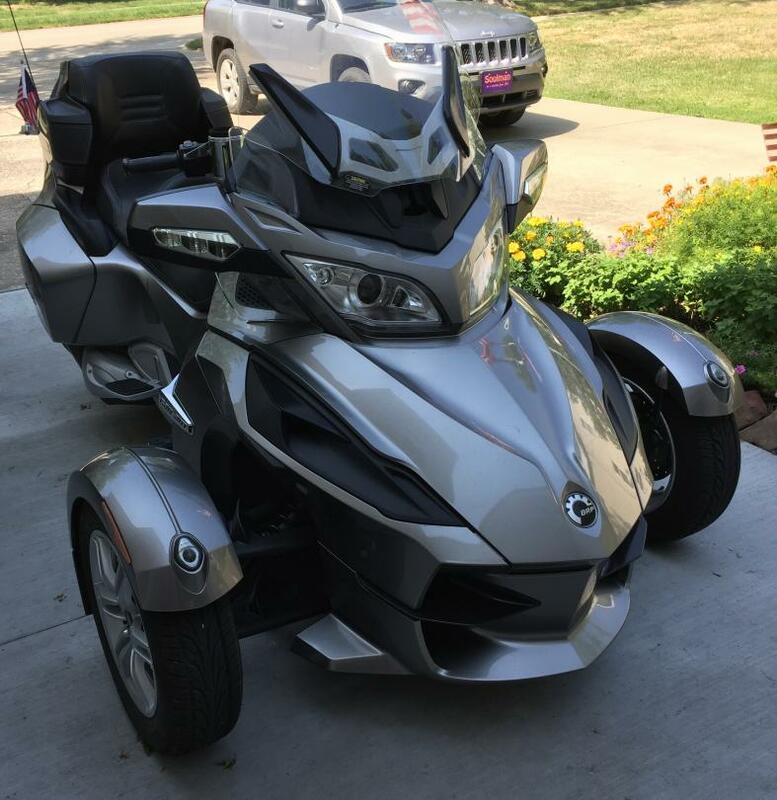 I just realized.....this (CanAm) will most likely be my last bike and my first bike was a CanAm (dirt bike), surrounding a bunch of Hondas. Hmmm. Don't ever ride a newer model with the 1330 engine. It might "seduce" you !!!! Hey Easy Rider, I read your post and agree that if you're used to the metric bikes like GoldWing the upkeep of a Spyder is quite a bit more. Unfortunately as we age we make more visits to the Dr...again more expenses;-) Growing up dollar callenged, I learned I could have a car but had to take good care cause I wouldn't have $$ to pay a mechanic (like owning my first Hog or BMW. Therefore, I suggest to anyone thinking of buying a Spyder, don't think of cutting corners but do learn how to 'upkeep' the machine. i.e. Invoices from previous owner: RnR Battery, $142.99 (battery) + 138.00 (1.5 hr labor)! Oil, filters, labor: $207.31. Not hard, just time consuming. Still a great ride. Earlier models seem to be more reliable than later models. Do more than scratch the surface.